You have a vision. We have the technology to bring it to life. Everyone has their own vision of how an AV solution should look and function. To help you meet your vision, we offer hundreds of pre-tested options that have proven to be compatible with our AV systems. These qualified options provide the design flexibility of a customized solution while maintaining the reliability of a standardized product. With a computer built into an AV system, users can quickly present information and videos from web browsers, installed applications or USB storage devices. The annotation option allows presenters to highlight information by making digital marks over any presented image using a finger or stylus on the touch screen confidence monitor. A microphone allows the presenter’s voice to be mixed with source audio and amplified through the built-in and/or peripheral sound system(s). Nomad offers both hardwired and wireless microphone options to choose from, including a gooseneck microphone, RF lavaliere microphone, RF wireless headset microphone and RF handheld microphone. 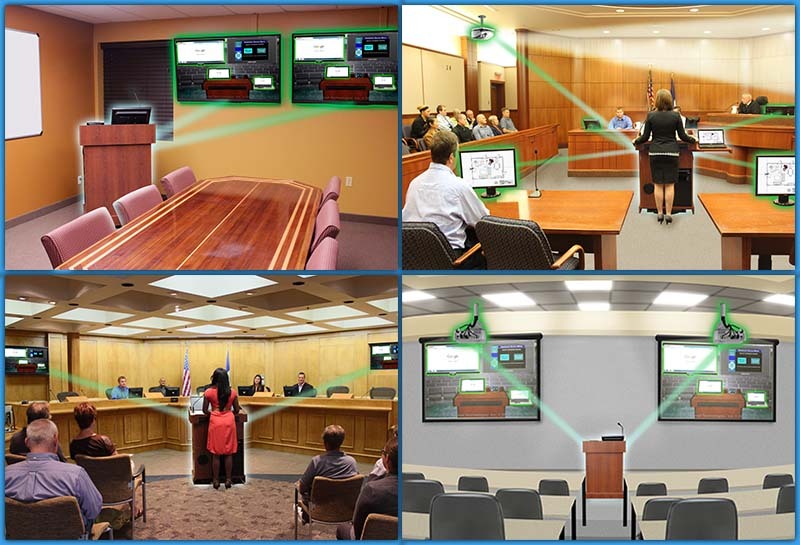 Nomad’s Presentation Systems can be prepared to work seamlessly with your video conferencing equipment. Nomad can adapt to a wide variety of VTC deployments. Free phone consultation is available to assist in defining each customer’s unique needs. A wireless HDMI transmission package allows the video output from the Nomad AV System to be wirelessly sent to display devices, eliminating the need for costly cable runs. 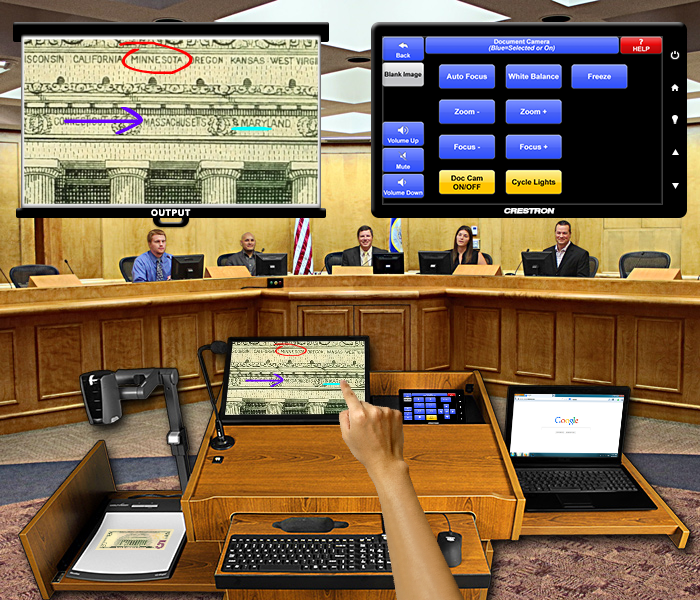 With the dual monitor upgrade, presenters can privately view the extended desktop of a built-in PC while presenting the primary display to the audience. Decrease or increase the distance from the projector to the screen with a short-throw or long-throw projection lens. Capture and record the presenter speaking along with all the material they are presenting with rich media recording equipment. The recording is put on the internet to be viewed from any location at any time by authorized participants. Nomad’s AV systems can be fully integrated with rich media recording equipment, or can alternatively be prepared to work with a customer’s external rich media recording equipment. Depending on the physical layout of the room or the desired configuration, Nomad offers a wide variety of options for multiple displays for any application. 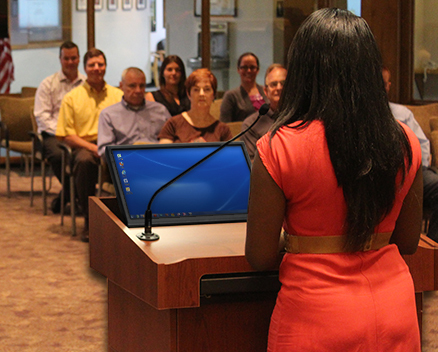 Additional projectors, large format monitors and personal monitors are commonly used to accommodate larger audiences. For greater brand continuity in a Nomad AV System, a Crestron DMPS can be used to consolidate several key components into one highly future-proof device. Provides a master power switch through the Crestron Control System. Timed power-down, power-up events can be automatically triggered for energy savings and enhanced room preparation. This option can also be integrated with RoomViewTM. A wireless touch screen control panel allows the Nomad AV System from up to 250 feet away. The presenter can move freely throughout the room or pass control to an assistant. This option provides infrastructure, programming and support for remote management of the Nomad AV systems through Crestron Fusion®. This option is required for each system that is to be Fusion® compatible. Fusion® software is not included. A secondary control panel works in concert with the mounted control panel to allow the Nomad AV System to be controlled from multiple points throughout the room.